This product has reached End of Life. Please contact Linx with any questions. The ES Series Basic Evaluation Kit is a quick way to evaluate the field performance of the ES Series transmitter and receiver and verify the performance of a custom design. 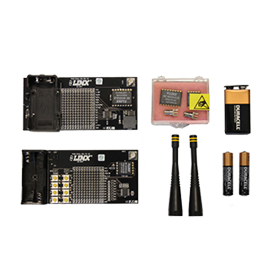 The kit features two fully assembled development boards for benchmarking and prototyping. One is populated with the ES Series transmitter and a remote control encoder. The other is populated with the ES Series receiver and a remote control decoder. Together, they implement a complete remote control solution. This allows for range and interference testing in the actual use environment. The boards include everything needed to test the performance of the system. Buttons on the transmitter board activate a buzzer and LED on the receiver board to provide visual and audible indication. The kit also serves as an example of implementing the ES Series and a benchmark against which the performance of a custom design can be compared. A small prototyping area allows for custom circuitry to be added directly on the evaluation board.